LG is known for lots of great things—chief among them being televisions and wonderful G series smartphones. But laptops? Not so much. But now LG’s trying to entice the US with its new Windows 10-equipped laptops, called the LG Gram Series. Although LG has a few laptops, like the UltraPC line, outside the states, the Gram is the first line for the U.S., and as a bonus, it’s coming as a Microsoft “Signature Series” meaning no bloat whatsoever—just pure Windows 10. But the name also refers to its amazing light weight at just over two pounds, which is even lighter than the very smallest Macbook Air. To achieve that impressively minuscule amount of Lbs, LG had to make a few design sacrifices—the biggest being the plastic shell all the hardware is incased in. After the shock of how light this laptop is fades away, you then start to notice the creaking plastic—from the keyboard to the screen bezel—and a few other missing features, like a backlit keys or an SD card reader. But as already mentioned, LG may not be known for laptops but their displays are some of the best in the world, and that’s true with the Gram series. The 1080p IPS LCD looks stunning on this laptop, even significantly better than Macbook Air’s Retina displays. The Gram also has the other laptop accouterments like an HDMI output, microSD card reader, a microUSB port, and two USB 3.0 ports. Although Apple’s Macbook and LG’s Gram laptops differ in many ways, on price they’re pretty similar. For the 13-inch model, you’re looking at an Intel Core i5 processor, 128GB of storage, and 8GB of RAM for $900. The supersized 14-inch model comes in anywhere from $1000-$1400, whether you chose 128GB/Core i5 or 256GB Core i7. The only real downside with these impressive specs is that they’re not the newly released Skylake processors but are instead Intel’s 5th generation Broadwell chips. 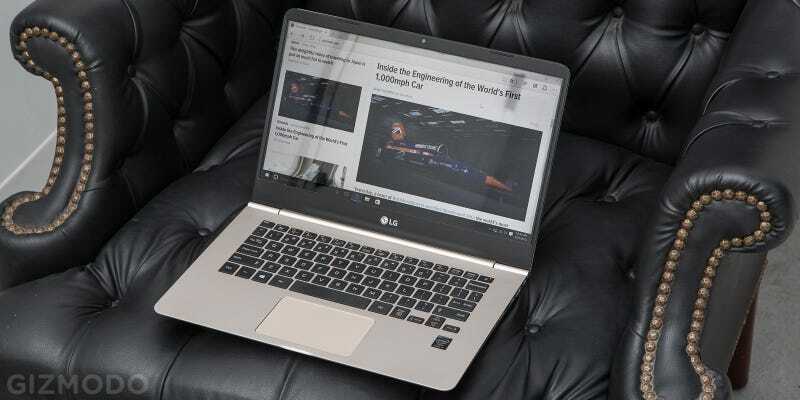 But overall, the LG Gram laptops feel like a pure travel machine, something ultra light that’s also ultra capable to handle most tasks within its reported seven and half hours of battery life. If you’ve been looking for just an everyday Windows 10 laptop, LG is offering up an interesting choice. The Gram Series goes on sale today on Amazon and will be in Microsoft stores soon.